The purpose of this experiment was to determine how water deficiency affects the rate at which Helianthus annuus, or sunflowers, produce oxygen during photosynthesis. Using a leaf chamber apparatus, the rate at which oxygen was produced from two leaves of a well- watered sunflower plant and two leaves of a dehydrated sunflower plant were measured during the oxygen-production phase of the experiment (Phase B). 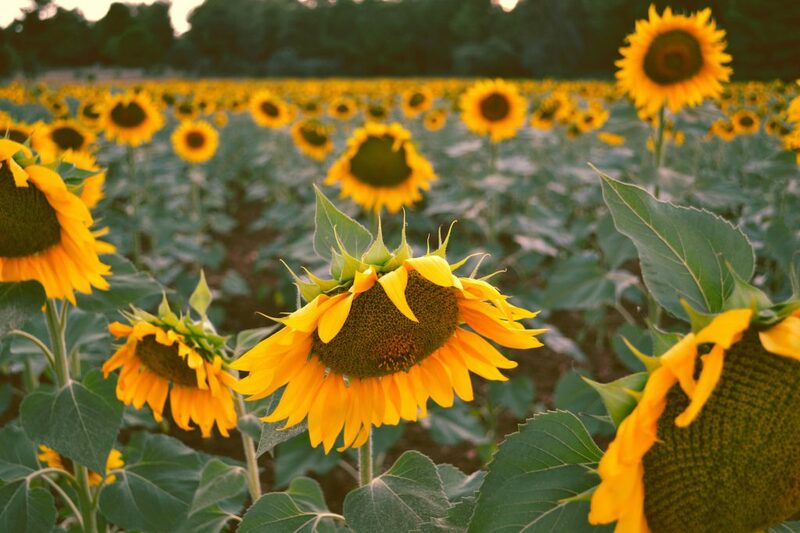 Using these oxygen production rates, the photosynthetic rates were calculated and compared in order to understand the connection between the lack of water and oxygen production in sunflower plants. For Phase B of the experiment, the average photosynthetic rate for the leaves of the well-watered sunflower plant was 465.3 μmol O2/ m2 /min ± 76.65 s.d. while the average photosynthetic rate for the leaves of the dehydrated sunflower plant was 353.5 μmol O2/ m2 /min ± 70.22 s.d. From these results, it can be concluded that the leaves of the well-watered sunflower plant produced oxygen at a faster rate than the leaves of the dehydrated sunflower plant produced during Phase B of the experiment. This study is important because it contributes to the ongoing research on the consequences of climate change for our environment. These findings show how drier climates may negatively impact oxygen production in water-stressed plants. Photosynthetic plants are considered photoautotrophs, organisms that use sunlight, water, and carbon dioxide to create their own food. Plants also serve as food for heterotrophs, organisms who eat other organisms because their bodies do not make their own food.10 Most importantly, plants help to sustain life on Earth by producing atmospheric oxygen during photosynthesis. Oxygen is essential for humans, and most animals, because we need oxygen to facilitate cellular aerobic respiration, a process in which the body breaks down food to produce most of the energy that drives the cellular processes necessary for our bodies to function properly.11 Since oxygen is vital to the survival of the human population, it is imperative that scientists further investigate how dry climates, and the accompanying water deficits, will impact the ability of plants to perform photosynthesis and, consequently, produce oxygen. The purpose of this experiment is to determine the rate at which photosynthesis occurs in the leaves of both well-watered and dehydrated sunflower plants. H. annuus, or sunflowers, require a moderate amount of water to survive and can be found in the interior region of North America12. As this region of North America is expected to experience drier summers, the sunflower serves as an appropriate model for the effects of water deficits, one of the consequences of climate change.3 We hypothesize that the photosynthetic rate will be less for the leaves of the dehydrated sunflower plant than the leaves of the well-watered sunflower plant during Phase B of the experiment, when the light-dependent reactions occur. Our reasoning for this hypothesis is that less water will be available in the cells of the dehydrated leaves to split into oxygen, so less oxygen will be produced and expelled from the plant during the light-dependent reactions. To test our hypothesis, we calculated the photosynthetic rate by measuring the rate of oxygen production because oxygen is one of the products of photosynthesis. For this experiment, oxygen production was measured at two phases: Phase A and Phase B. Phase A corresponds to the part of the experiment when the light is turned off and only the light-independent reactions of photosynthesis occur. Phase B starts when the light is turned on and consists of both the light-independent and the light-dependent reactions of photosynthesis. In order to measure and record the change in oxygen production over time for the leaves of both the well-watered and dehydrated sunflower plants, a leaf chamber apparatus and the PhotoLab data collection program were used. This information allowed us to calculate the overall photosynthetic rate of the leaves. The well-watered sunflower received water daily. To dehydrate the sunflower, water was withheld for one week prior to collecting data. This treatment was applied to the sunflower after its development. The methods for this experiment followed the detailed instructions provided in the Principles of Biology 1 Laboratory Manual.13 A beaker containing 200 mL of cool tap water was placed on top of the leaf chamber to act as a heat filter, and a light was set 11 cm above the chamber for the leaf to use as an energy source. (Note: during Trial 1 for the watered sunflower, the light was not initially placed at 11 cm above the chamber– see discussion for further details.) We collected data during both Phase A and Phase B for each leaf. Phase A began when CO2 gas was inserted into the leaf chamber, by exhaling carbon dioxide gas into a tube connected to an inlet gas port on the apparatus, and the oxygen concentration dropped significantly. Phase A ended when the inlet gas port was closed and Phase B began when the light was turned on. The PhotoLab software collected oxygen gas concentration measurements 30 times per minute for a total of 20 minutes per trial. The PhotoLab software also determined the slopes of both Phase A and Phase B. These slopes (m) corresponded to the change in oxygen gas concentration per amount of leaf tissue present in the chamber for each selected phase. The temperature of the room (T) was 24˚C, and the surface area of each leaf was determined in square meters following the instructions provided in the Principles of Biology 1 Laboratory Manual.13 The equations used to normalize the slope into standard units and to calculate the photosynthetic rates of both phases for each trial were also provided by the “Principles of Biology 1 Laboratory Manual” and are displayed below in Figure 1. Figure 1. Equations used to calculate the photosynthetic rate during each phase. In Equation 1, “m” represents the slope in percent of oxygen gas per amount of leaf tissue in the chamber per minute. In both equations, “y” represents the slope in normalized units of micromoles of oxygen produced per liter of air in the chamber per minute. Equation 1 was used to normalize the slope into standardized units. Equation 2 was used to calculate the photosynthetic rate in micromoles of oxygen produced per square meter of leaf tissue in the chamber per minute. Over a 20-minute time period, we determined the oxygen production rate for two leaves of the well-watered sunflower plant and two leaves of the dehydrated sunflower plant. This data is presented as the slope (m) and the photosynthetic rate of both Phase A and Phase B in Table 1. The photosynthetic rates of both sunflower plants are negative values during Phase A due to the intentional increase of CO2 gas and the reduction of O2 gas in the leaf chamber. As shown in Figure 2, the leaves of the well-watered sunflower plant had an average photosynthetic rate during Phase B of 465.3 μmol O2/ m2 /min with a standard deviation of ±76.65. The dehydrated sunflower plant had an average photosynthetic rate of 353.5 μmol O2/ m2 /min during Phase B with a standard deviation of ±70.22. Figure 2 shows that the average photosynthetic rate of the well-watered sunflower plant during Phase B was higher than that of the dehydrated sunflower plant during Phase B. Table 1. Data collected from two leaves of the well-watered sunflower plant and two leaves of the dehydrated sunflower plant during the experiment. The slope (m) and photosynthetic rate were determined for each leaf during both Phase A and Phase B. Figure 2. 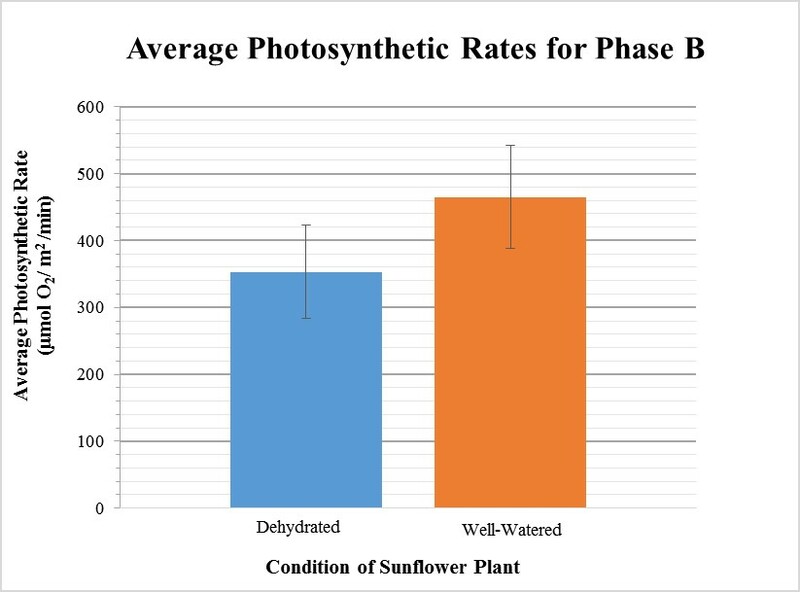 Average photosynthetic rates for Phase B of both the dehydrated and well-watered sunflower plants. The photosynthetic rates during Phase B of both trials for each sunflower plant were used to calculate the average photosynthetic rates. The average photosynthetic rate of the well-watered sunflower plant was 465.3 μmol O2/ m2 /min ± 76.65 s.d. while the average photosynthetic rate of the dehydrated sunflower plant was 353.5 μmol O2/ m2 /min ± 70.22 s.d. The sample size for each condition was 2. The error bars represent the standard deviation. Our collected data supports our hypothesis. During Phase B, the dehydrated sunflower plant had a lower average photosynthetic rate compared to that of the well-watered sunflower plant (Figure 2). When evaluating the significance of our results, one should consider that our experiment had an extremely small sample size. Our results are not considered to be generalizable to a larger population. During the experiment, a few errors occurred that skewed our data. One error that impacted our results was inconsistent light levels. For example, during Phase B of Trial 1 for the well-watered sunflower plant, the light was set farther than 11 cm above the leaf chamber. As a result, Trial 1 had a lower photosynthetic rate during Phase B than Trial 2 (Table1). This is likely because the chlorophyll molecules in the thylakoid membrane absorbed less light, so less energy was available to conduct photosynthesis, which means only a limited amount of products, like oxygen gas, were produced.8 The light level should have been at the same intensity at the start of every trial so the only changing variable would be the amount of water in the plant. Another experimental error occurred during Phase A of Trial 2 for the dehydrated sunflower plant. A loose screw caused some ambient oxygen to seep into the leaf chamber at the beginning of Trial 2, but the screw was tightened before the initiation of Phase B. If this experiment is repeated, several improvements are needed. More trials should be conducted for each plant tested. Light intensity should remain consistent for each trial. Also, the screws on the apparatus should be checked to make sure they are tightly closed before initiating Phase A of each trial. These changes to the experiment limit the potential for other factors to influence the results and provide consistency which makes the data more accurate and reliable. Further research should be conducted to study how other consequences of climate change besides water deficits will affect oxygen production in plants, such as shifts in the timing of seasons.2,4 In addition, more research should be done to study how high concentrations of carbon dioxide gas impact photosynthetic rates in plants because increasing atmospheric levels of CO2 is one of the major contributors to climate change.1 Moreover, carbon dioxide is important for the light-independent reactions which cannot function properly without the light-dependent reactions and vice versa8 In this way, both reactions work in tandem allowing plants to effectively perform photosynthesis. Experiments such as this one are essential to help people understand how the consequences of climate change, like dry climates and changes in precipitation patterns, can affect our environment and agroecosystems. The scientific community should continue to closely monitor the effects of climate change that may reduce the photosynthetic productivity of plants because they create the sustainable, oxygen-saturated environment that allows our species to survive. The results of experiments similar to this one can also serve as evidence that can be used to support claims and arguments made by scientists in response to opposing parties who may think climate change will have no real effect on our lives. For the sake of the future generations of the human population, actions must be taken now to prevent further destruction of the planet that cannot be undone nor recovered from. 1. Santer, B. D. et al. A search for human influences on the thermal structure of the atmosphere. Nature 382, 39-46, doi:10.1038/382039a0 (1996). 2. Climate Change Indicators, <https://www.epa.gov/climate-indicators/weather-climate> (2016). 3. Sheffield, J. & Wood, E. F. Projected changes in drought occurrence under future global warming from multi-model, multi-scenario, IPCC AR4 simulations. Climate Dynamics 31, 79-105, doi:10.1007/s00382-007-0340-z (2008). 4. Regonda, S. K., Rajagopalan, B., Clark, M. & Pitlick, J. Seasonal cycle shifts in hydroclimatology over the western United States. J. Clim. 18, 372-384, doi:10.1175/jcli-3272.1 (2005). 5. Breshears, D. D. et al. Regional vegetation die-off in response to global-change-type drought. P Natl Acad Sci USA 102, 15144-15148, doi:10.1073/pnas.0505734102 (2005). 6. Spuhler, D. & Carle, N. Crop Selection, <https://www.sswm.info/category/implementation-tools/water-sources/hardware/conservation-soil-moisture/crop-selection> (2012). 7. Causes of Drought: What’s the Climate Connection?, <http://www.ucsusa.org/global_warming/science_and_impacts/impacts/causes-of-drought-climate-change-connection.html#.WTXPGvnyvIU> (n.d.). 8. Chemistry, R. S. o. Photosynthesis, <http://www.rsc.org/Education/Teachers/Resources/cfb/Photosynthesis.htm> (2004). 9. Cornic, G. & Fresneau, C. Photosynthetic carbon reduction and carbon oxidation cycles are the main electron sinks for photosystem II activity during a mild drought. Ann Bot-London 89, 887-894, doi:10.1093/aob/mcf064 (2002). 10. in Exploring Your World: The Adventure of Geography (ed M. G. Dunn) (National Geographic Society, Washington D.C., 1989-1993). 11. Cellular Respiration, <https://highered.mheducation.com/sites/0073031216/student_view0/exercise11/cellular_respiration.html> (2017). 13. Armstrong, N., Flint, V. & Miller, K. Principles of Biology 1 Laboratory Manual. 2nd edn, 57-61 (Hayden-McNeil, 2014). 14. Dekov, I., Tsonev, T. & Yordanov, I. Effects of water stress and high-temperature stress on the-structure and activity of photosynthetic apparatus of Zea mays and Helianthus annuus. Photosynthetica 38, 361-366 (2000). Acknowledgments: First and foremost, I would like to sincerely thank my Biology 1107 GLA, Mariel Pfeifer, for nominating me to submit my research paper to the The Classic Journal. I would also like to thank both Mariel and the editors of The Classic for critiquing my paper and helping me through the revision process. I would also like to thank my Bio 1107 group who I conducted this experiment with: Hannah, Joy, and Ryan.